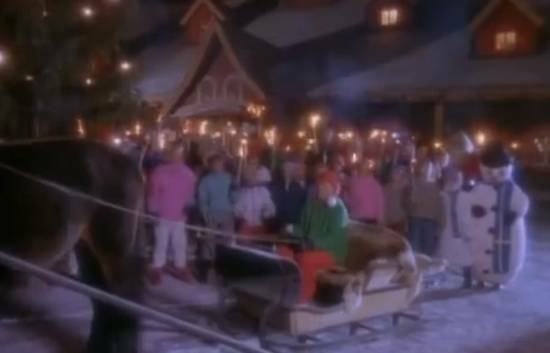 Some days ago, for the first time in my adult life, I saw the music video for a popular Christmas carol. It was…disturbing. It may have been an unreleased sequel to The Shining. For 33 years, I have successfully dodged this visual trip into the realm where happiness is just a mask you put on to pretend you haven’t gone mad. So what scary Christmas carol am I talking about? “Satan’s Little Helper”? “All I Want For Christmas Is Kill Kill Kill”? 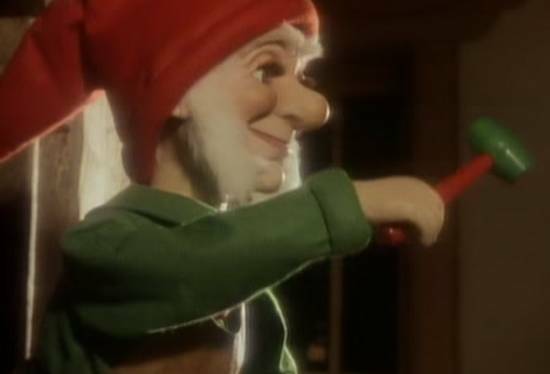 No, I’m talking about “Merry Christmas Everyone,” by Shakin’ Stevens. Sure, the song may be a family classic and a perfectly decent Christmas carol. But the video…man, the video. I can’t describe the creepiness of this video without going into detail, which is why I’m offering a scene-by-scene account. Yup, I’m about to ruin “Merry Christmas Everyone” for you the same way I ruined The Sound Of Music for everybody. In the opening shot, a girl enters an airport terminal through a door with a clearly marked “EXIT” sign. While not necessarily unusual—most doors are both exits and entrances—this creates the “something’s off” vibe for the rest of the video. The girl is pushing a luggage cart, the sound of its shoddy wheels echoing through an airport that’s eerily devoid of people. Is she the only one traveling this Christmas? The girl is completely alone; nobody is there to see her off. Either she has the worst parents in the world, or her family and loved ones are all dead. I don’t know which is worse, but way to set the Christmas mood, video. After a brief flight in the cockpit with an unenthusiastic pilot randomly pointing at the barren landscape below, the girl arrives…somewhere. She’s met by three people dressed in the exact same green-and-red elf uniform. She gets an awkward hug and two lukewarm handshakes. 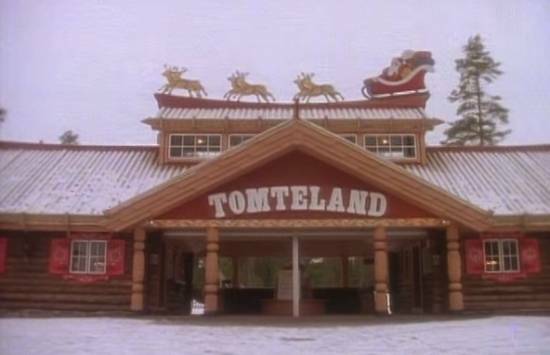 Each of the three “elves” chants “Welcome to Santa World,” which a keen geography student will notice is not a place that exists. They’re lying to you, child! The flight attendants wave goodbye, and we realize that the girl was the only passenger on that plane. What? This can’t possibly be a profitable venture for the airline. 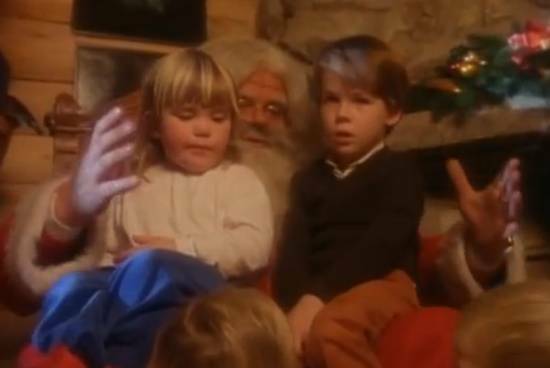 Is this a lavish Christmas miracle where some rich benefactor went all out to make a child’s wishes come true? If so, why the commercial airline instead of a private jet? What’s with the cheap, dollar-store uniforms on the three elves? Why does an old bus deliver the girl to her final destination in the very next scene? When will all the lies stop?! Run away, child, this is your last chance! Ah, but too late: Shakin Stevens—the artist himself—leaves the bus behind the girl and ushers her inside the haunted Tomteland house. We’re now almost one full minute into the four-minute video, and the song hasn’t even started yet. All we’ve witnessed is what appears to be an expensive and elaborate kidnapping. 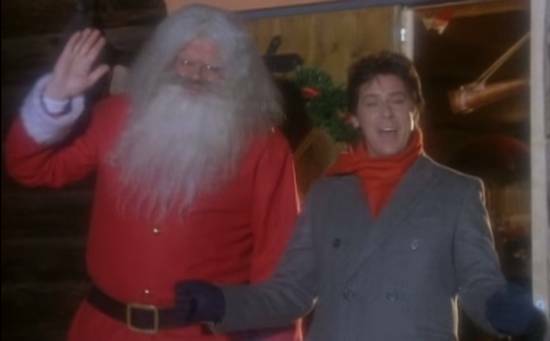 No time to think about that now—Shakin Stevens is singing alone in the snow, assuring us that the children are, in fact, “having fun.” There are other children out here? Did they all arrive on separate airplanes? Where are you getting all these children from, Stevens? We can’t be sure where Stevens finds the children, but we do know what happens to them: Stevens appears on a horse-drawn carriage driven by a hollow husk of a human being—a biological automaton who’s unable to display any emotion but is forced to feign happiness. This former child clearly doesn’t want to be there. Inside Tomteland, we’re treated to a scene from “Where’s Waldo” as envisioned by H.P. Lovecraft. If you don’t find Waldo, Waldo finds you! 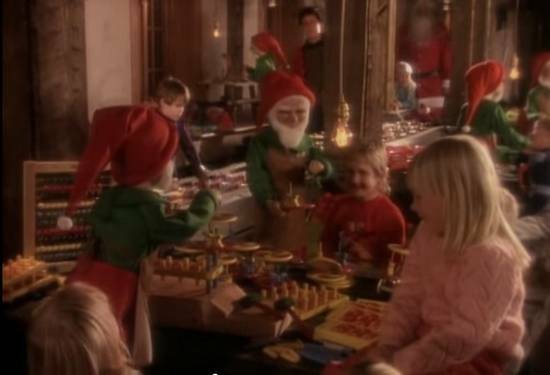 But at least “Santa” and Stevens are teaching children things like hard work and the joy of making toys, aren’t they? And what would a snowball fight be without an abominable anthropomorphic snowman? After yet another shot of Stevens taking the horse to Tomteland, we’re back inside. Here, a hypnosis session is ongoing to brainwash the remaining, mentally resilient children. By the end of the video, the children are successfully transformed into a wild lynch mob with torches. So there you have it, folks: “Merry Christmas Everyone” is about a sinister sect of humanoid aliens kidnapping orphans and converting them into mindless weapons of mass destruction. Or it could just be an innocent Christmas video about a bunch of children having fun at Santa World…but that’s what they’d want you to think, isn’t it? Hahahahahahaha. Went out to figure out which Tomteland was used in this video, and found your blog. It gave me a good laugh. Tomte is the Swedish word for Santa. It is also used in Finland as they have Swedish as their second language there. As for the rest of the video, I can understand that someone used to the big cities would find most of it weird. Small airports away from the large cities are often very empty. As for the rest, well, nothing can compensate for simply bad acting, and we all know that 99% of all horror movies are lacking funds, and also are riddled with terrible actors. Happy to give you a laugh, Matthew! Thanks for stopping by. The budget for this video production was low. It allowed the truth to be told to your critical eyes. Thankfully- we have you cluing us in! 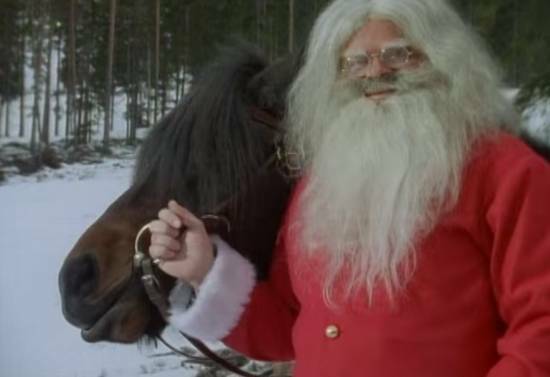 Otherwise, I would have just thought it was another sweet Christmas video! Happy New Year Daniel! Here’s to 2015! It’s scary how much creepy stuff they can sneak in on a low budget! I’ll stay vigilant and keep everyone updated on any further creepy developments in music videos from the last century. Thanks, and Happy 2015 indeed! I love the ‘hollow husk of a human being’; so true, she appears to be suffering hypothermia. Have a great Christmas, Daniel. Actually, judging from the vacant stare in her long-dead eyes, hypothermia would be a welcome escape from this mortal existence. Merry Xmas and a great new year to you too! Definitely creepy, especially the singer’s sweater. That alone would make me run and hide. As for the “anthropomorphic snowman”, I think it worked better in Frozen. This one’s a bit frightening. Glad I’m not the only one reading into this. We’re on to you, creepy video!